Certain members of the Raie Manta Club crew are present year-round, others come work as reinforcements during high season, still others come and go throughout the year. We are all at your service, and will do everything possible to ensure that you have unforgettable vacations. You can live your experience in French, English, Italian, Spanish, Japanese and even from Réunion. Yves LEFEVREmonitor BEES1, and professional underwater cameraman, has worked with Christian PETRON or CINEMARINE on films such as "Le Grand Bleu", "Atlantis", 'La Danse des Baleines"(Dance of the Whales). He’s the founder of the Raie Manta Club. A fanatic about diving in Rangiroa, where he lives, he will guide you to discover the natural treasures of the passes as no one else can. Livia, BEES1 instructor, is part of the leadership of the Raie Manta Club since summer 2010. Livia coordinates the organization of dives. Her pedagogical approach is particularly appreciated for the supervision of 'child' and 'beginner' dives. His wise advice are valuable for the choice of dive sites. At the helm of the boat, it ensures our security. 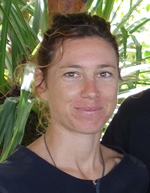 Stephanie, instructor for 20 years, settled in tuamotu since 10 years for love of marine life in these passes. 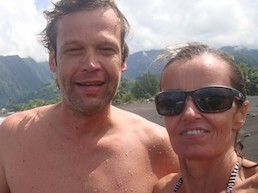 Robert joined her 3 years ago, to invest herself totally in the life of the club and satisfy his passion for diving. This fr-german tandem combines experience and enthusiasm! 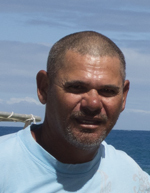 Franck Rodulfo, underwater diving instructor, naturalist guide is passionate about wildlife since his childhood. 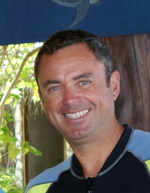 He has been teaching divers in Polynesia since 2008. His deep knowledge of the underwater world, his expertise in passing dives and his enthusiasm makes him a very popular guide. Eric LEBORGNE, BEES1 instructor, works in the RMC since 1985. Expert in Marine mammals, it identifies and tracks for 15 years the evolution of dolphin families living in the passes of Tiputa and Avatoru. It is also responsible for the Rurutu humpback whale watching Center since its creation in 1996. Michel BEGUE is hyperbaric infirmier, BEES1 and MF2 instructor, at RMC from the very beginning. 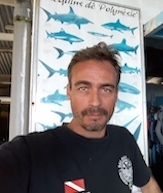 Our friend Michel, diver professional, is "director of special operations" during the shootings and shipments Scientists in the Raie Manta Club. Yann HUBERT working with the RMC since arriving in Polynesia in 1994. His in-depth knowledge of underwater fauna and flora has made it a popular guide passionate photographers. He is co-author of the film "7th Heaven gray sharks" and participates in numerous underwater filming expeditions around the globe. Christian Allanic is BEES 1 instructor and gives a hand to RMC. Christian is instructor closed circuit rebreather (Inspiration and Evolution). Its main activity is the organization of diving cruises in the Maldives with OK Maldives. How was your first dive? Care for tea and cakes ? The Raie Manta Club partner of Tendua supports worldwide programs for preservation of Nature and Wildlife.